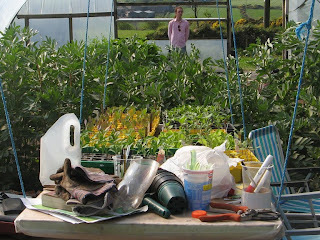 Many thanks to Genevieve, who wwoofed with us for 2 weeks in April, your help was much appreciated. 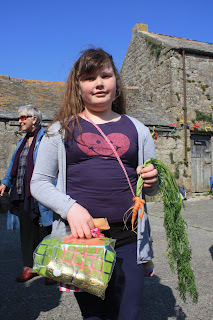 Genevieve helping at the EGGstravaganza jumble sale. 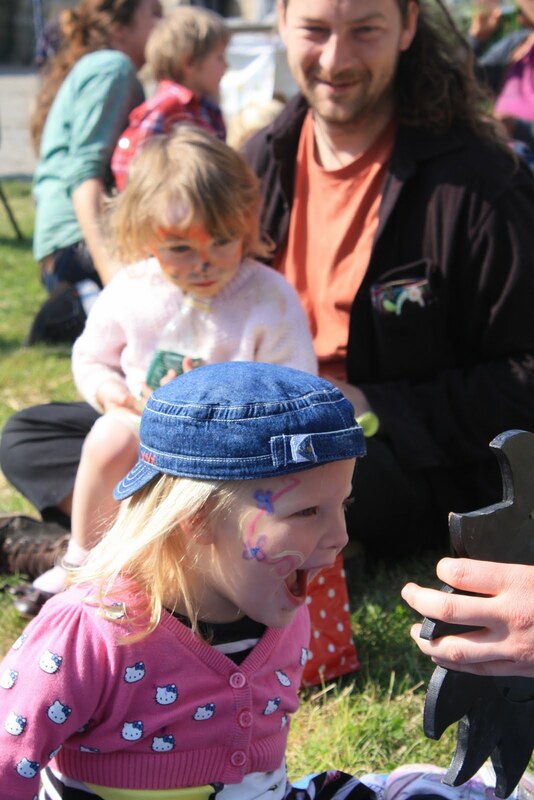 As you may have noticed, three little pigs arrived at the farm on Saturday 16th April, just in time for the EGGstravaganza. The pigs were supplied by a local farmer, 4 miles away, but they do not come from organic stock. 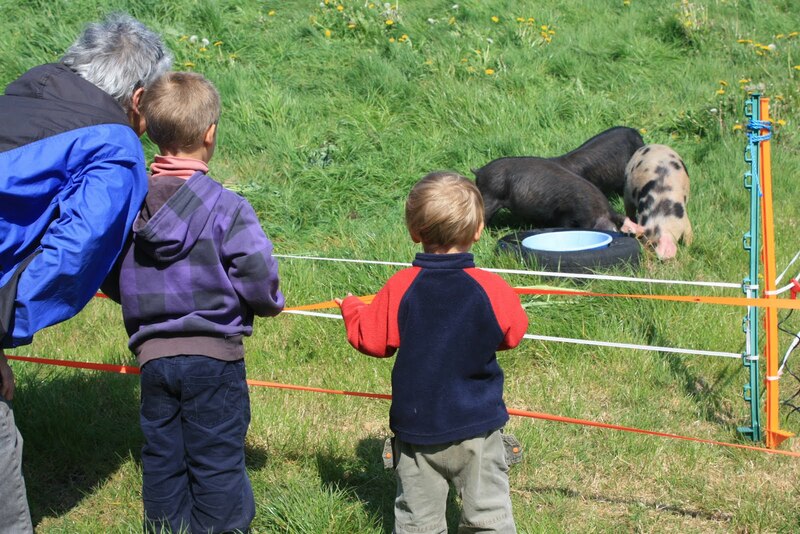 They will be raised on organic land, and fed organic feed, so we can refer to them as "organically reared" pigs. 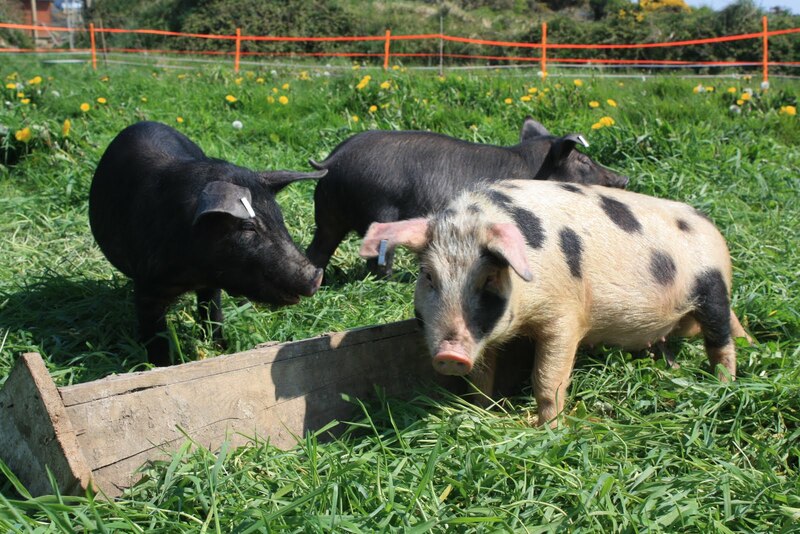 In autumn they will be made into sausages and bacon, and sold in one-tenth-of-a-pig portions to family and friends of the community farm (i.e. their meat will not be commercially available). Despite appearances, they are sisters. The spotted pig is called Penny. At the EGGstravaganza we asked people to write down names for the two black pigs, and a jury of volunteers today chose the suggestions of Sage and Onion for them. As the pigs are for eating, quite possible with sage and onion, their names are a reminder of their destination (the dinner plates of St. Just), and make the connection between living farm animals and their meat as a human food source. We hope they'll be very happy here in their six months of life. Thanks to Fran for sending these ones. 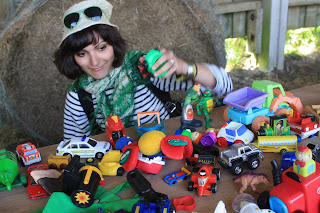 Jumble sale in the open barn. Penny the pig, with Sage and Onion behind. The chickens, in case they felt neglected due to the arrival of the pigs! 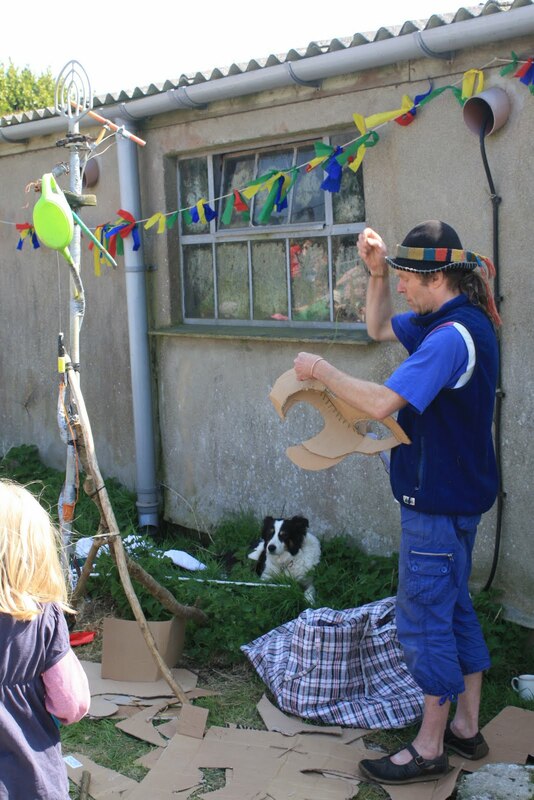 Bob (the Builder) has been a regular volunteer at the farm for the past four months, but is now in the process of moving on to pastures new, with a view to keeping his own chickens and constructing a polytunnel. We already miss him! 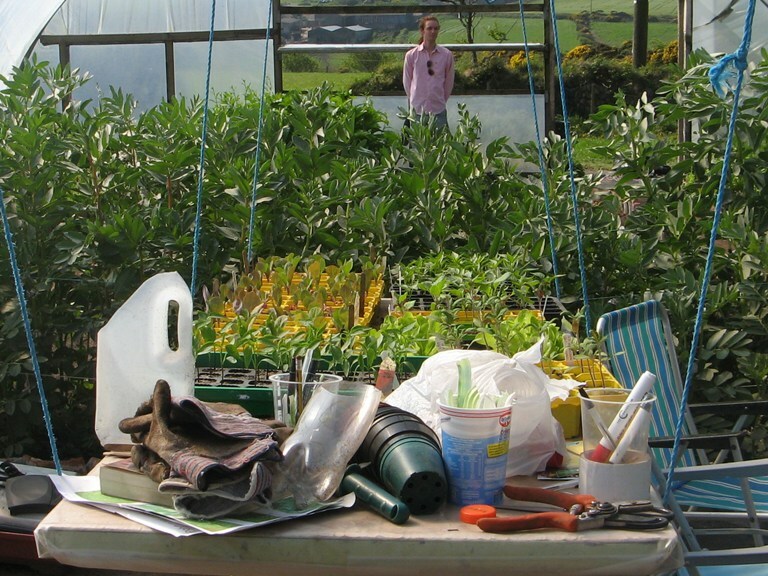 Bob has been incredibly helpful, particularly in the DIY department - tree-bogs, outdoor sinks, chicken fence, Hive ceiling, workshop etc... - but also out on the land. We wish him all the very best in his new endeavors, and don't forget to stay in touch. P.S. You won a bottle of wine in the EGGstravaganza raffle, so call in and collect it sometime! Sunday 17th April saw at least 200 people head down to Bosavern Community Farm for a fun-packed day of Easter fun, thrills and spills. Scarecrow making in the farmyard. 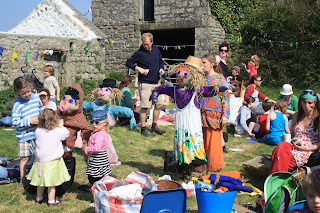 Kicking off at midday, our Easter offering involved scarecrow making, egg decorating, throw the welly, biscuit decorating, tea and cakes, soup and bread, tortilla, scones and cream, tug-o-war, egg hunt, raffle, jumble sale, second hand book stall, name that carrot, eggy dip, name the pigs, egg throwing, farm produce, face-painting, guitar serenades, and polytunnel tours. The finest spread of cakes known to mankind. Decorating eggs in the newly-renovated "Hive". 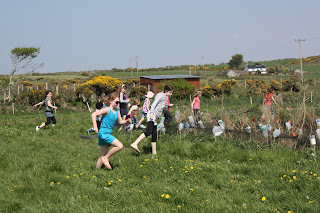 Easter egg hunt causes a stampede in the vegetable field. 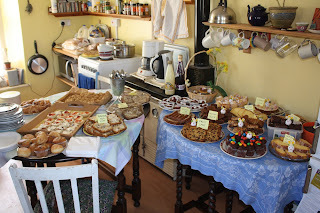 The day was a massive success, raising over £500 for the farm, but the most important thing was that hundreds of people came to the farm, spent their afternoon here, supported the project, and had a great time into the bargain. 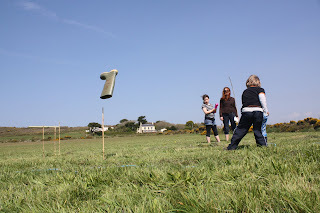 Many thanks to everyone who came, and to all the volunteers who helped organise the event. Joan and Sonia taking a well-deserved break in the kitchen. Holly and Allan preparing for the raffle draw. "Name that carrot" winner with her two prizes. Face-painting - WOW do I look like that?!!! 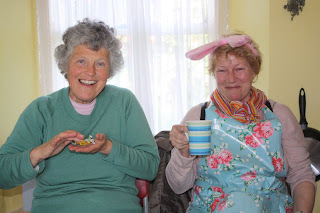 The winning name for the carrot was "Sesame Sprout", which won a chocolate Easter egg.....plus the carrot of course. 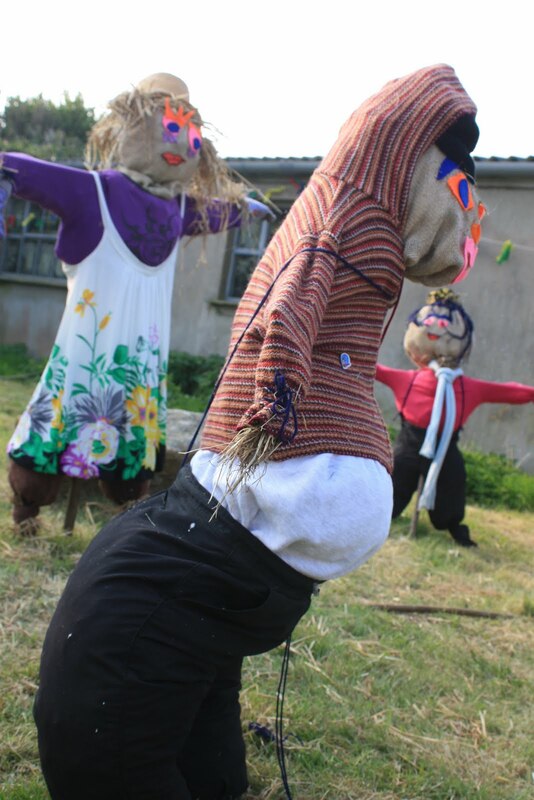 Two of our new scarecrows have taken up residence at the end of the drive for the pleasure of passing motorists and people stopping to buy eggs and salad at the farm gate, whilst the others will soon move to the vegetable field to begin their working life. 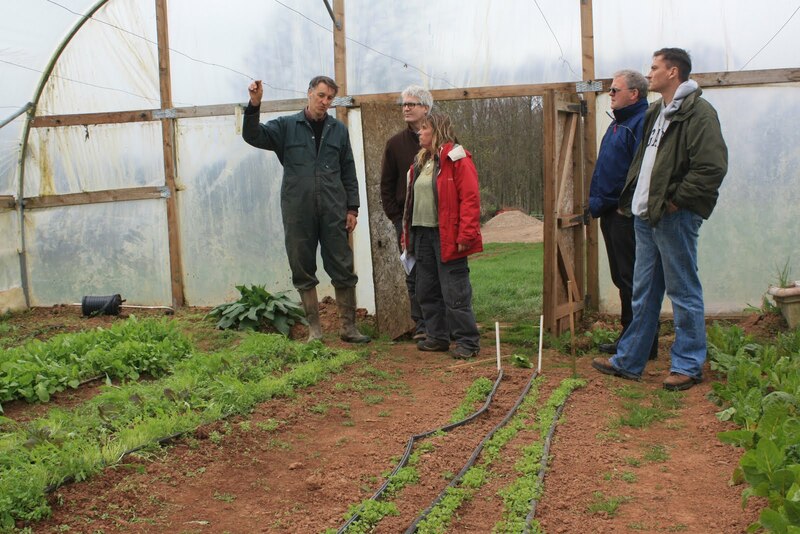 As usual on our open days and at our events, the overall mood was very positive, with many people saying what a great project the farm is and what good work we are doing here. As we are a community farm, the opinions of the community are of paramount importance to us, and positive messages like this make all the hard work and our very existence worthwhile. 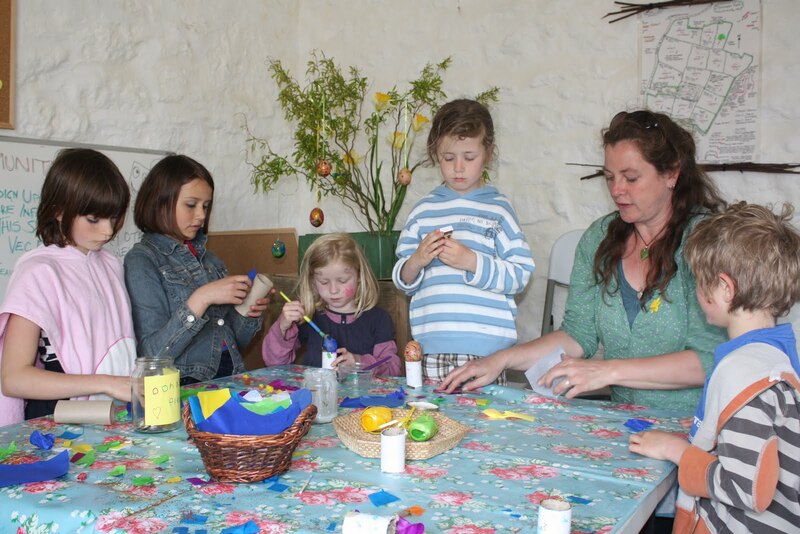 Our Easter event, the EGGstravaganza, kicks off at 12 noon on Sunday 17th April, and goes on till 4pm. 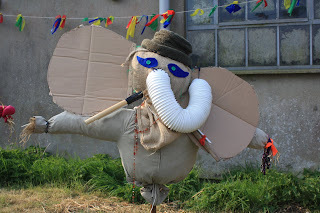 Everybody is welcome to come on down to the farm to join in the fun and games. There will be a raffle, jumble sale, second-hand book stall, refreshments in the farmhouse kitchen, Easter egg hunt, welly-throwing, tug-o-war, farm stall, chicken sponsorships, egg decorating, and other games and sports, plus the chance to have a look around the farm and see what we've been up to since the last open day in November. 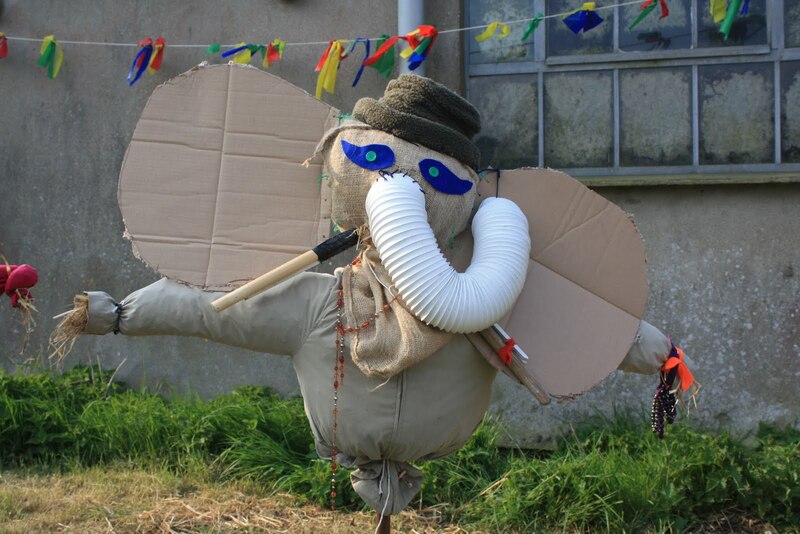 Parking will be in the field (or walk from St. Just), entry is free, but events are by donation or for a nominal charge. See you there! Many thanks to Vic from Cornwall Council, who brought a van round on Friday and gave us lots of tables, chairs, white-boards, shelving, and two office desks, all of them rejected by the council. They will be put to very good use in our classroom and on the upcoming EGG-STRAVAGANZA!!!!! 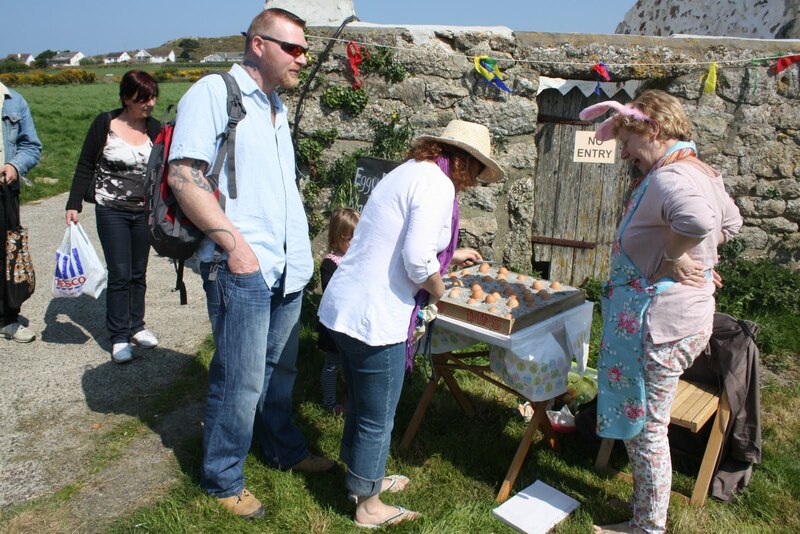 Bosavern Community Farm continues to do well at Pendeen Farmer's Market, held in the Centre of Pendeen every first and third Saturday of the month, 10 till 1pm. 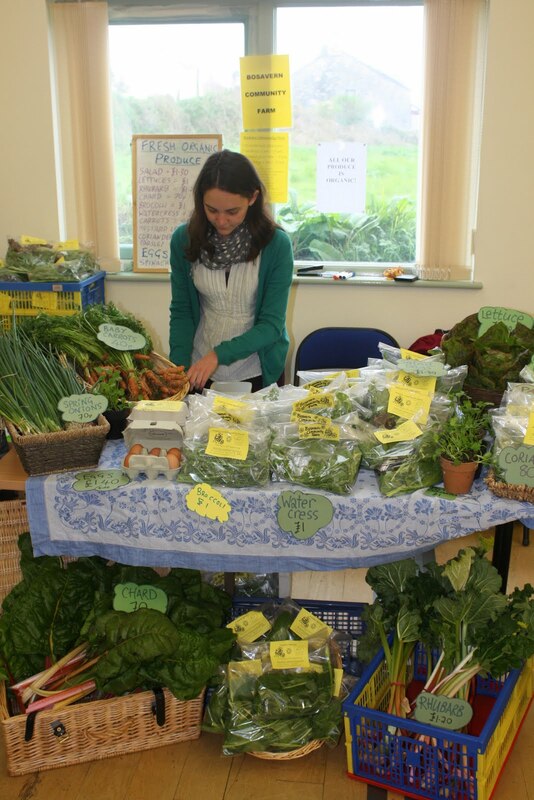 Alice setting up our stall. 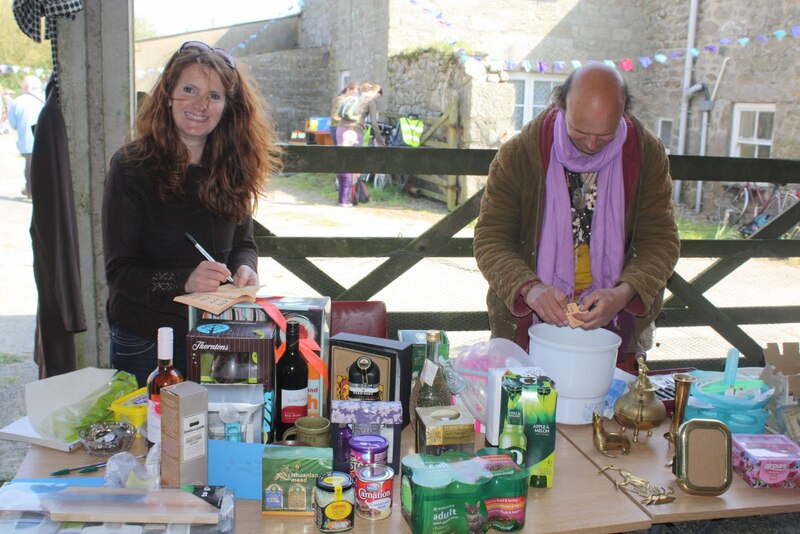 On Saturday 2nd April we took £97 at the market, all of which will help the farm and the community it serves. As you can see from the photo, we sold spring onions, Japanese bunching onions, baby carrots, eggs, watercress, hot mustard leaves, fresh salad bags, parsley, coriander leaves, pots of living coriander, rainbow chard, lettuces, mixed salad bags, spinach, green sprouting broccoli, and rhubarb. Thanks to everyone who supported us, and see you again this coming Saturday. Camel CSA's write-up about us. 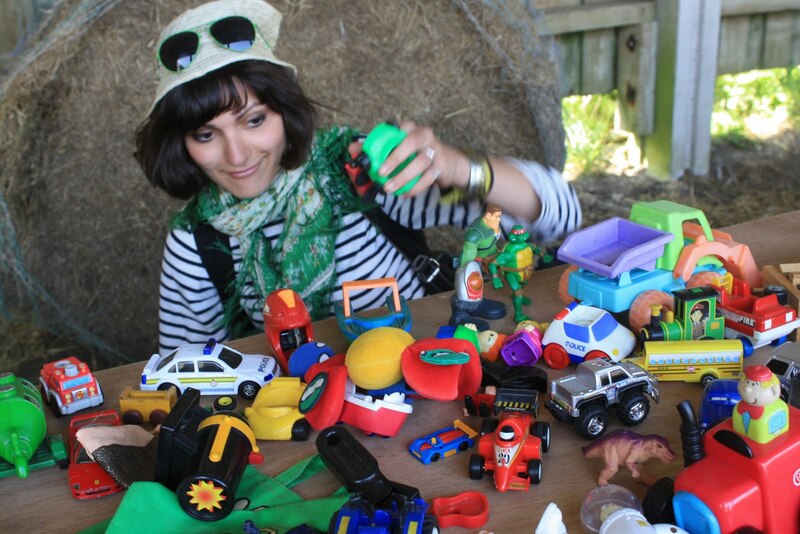 Many thanks to Charlotte at Camel Community Supported Agriculture for this write-up on their website following her visit to Bosavern Community Farm. 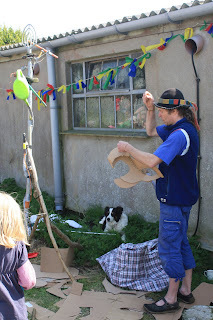 On Thursday 31st March, 5 of the Bosavern Community Farm team took a "learning journey" to The Community Farm at Chew Magna, near Bristol - see their website www.thecommunityfarm.co.uk for more details. 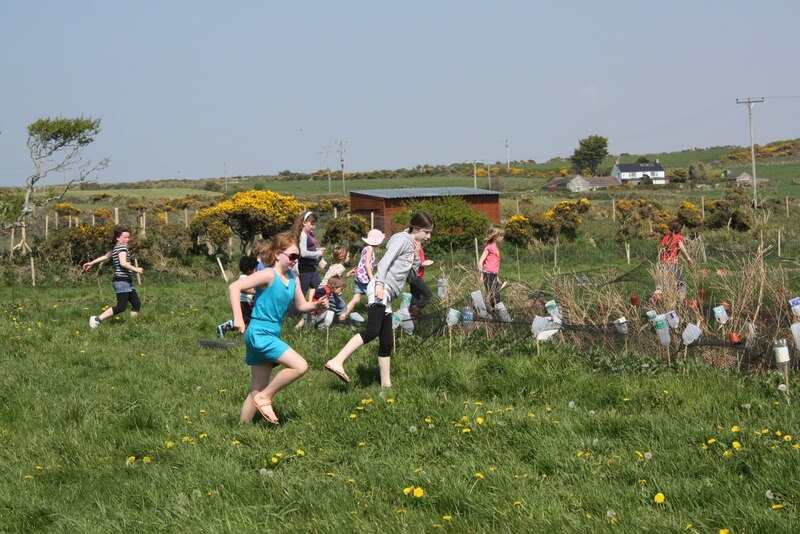 The farm was a private enterprise which has recently been bought by the community through a community share issue, and supplies 350 vegetable boxes a week to local residents. Many thanks to Phil for showing us around, explaining their set up, and being patient with the questions we bombarded him with - it's always fascinating for us to see how other schemes operate, and we never fail to pick up useful tips, making visits like this highly valuable. 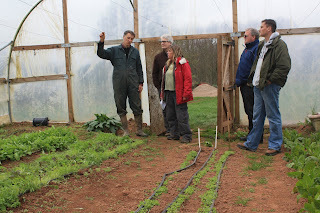 Phil explaining how their polytunnels operate.